My friend/cousin-in-law, Jess got me some of the fabulous Mary Kay Eye Make-Up remover and a long sleeve of cotton rounds a couple of years ago for my birthday. I used up that one, and I think I bought one more bottle and I really liked it. The next time I ran out, I didn’t have the extra $15 (when you include shipping) in my budget that week to replace it. Most days, I use water-proof mascara and eyeliner and I was used to the good stuff, so whatever I came up with had big shoes to fill. 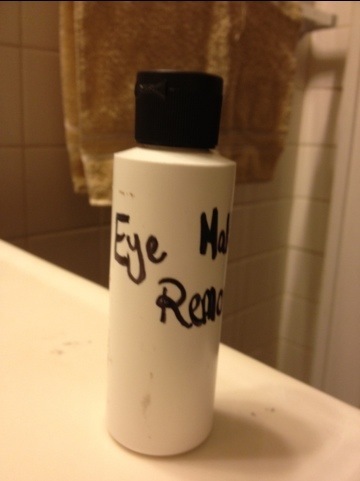 I googled “make your own eye make-up remover” and one of the first recipes I found sounded really simple. It was, in fact, so simple that from Google search to clean eyes took me about 10 minutes (and that’s just because it took me about 5 minutes to find the baby oil). I was lucky in that I had all of the ingredients in my home that night. Chances are if you have a child under 5 in your house, you do, too. The first thing you’ll need is a good container. The smart thing to do would be to save an old eye make-up remover container and use that. I wasn’t that smart. This bottle was a discounted bottle of face wash I got at CVS. I’d saved it because it was simple and looked like it could be useful someday. I now save all bottles I come across that look like this for my DIY projects. 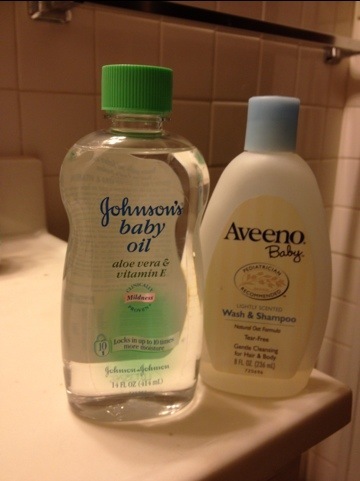 The next thing you’ll need are the 3 ingredients: baby oil (I had an unopened bottle I got as a shower gift), tear-free baby shampoo (I used Aveno because it was unscented) and WATER. That’s it, folks–and they charge upwards of $10 for this stuff. Unbelievable. You’re done. Seriously. How easy was that?? I figure I have enough baby oil in that bottle to be able to make my own eye make-up remover for the rest of my life. I do shake it up each time I use it. Just squirt a small amount onto your cotton round of choice (more on that later), rub on your eyes and be eye make-up free.